From Nara you can conveniently reach Japan's first capital in history 飛鳥 Asuka by train. What always fascinated me about Asuka, and why I really wanted to see is, because the location for Japan's first capital was selected in accordance with upcoming Buddhist ideals. 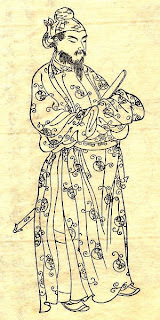 Asuka was Japan's capital from 538 - 710 A.D. in the Asuka Period. In the same period Buddhism reached Japan over India - China - Korea and found acceptance and many followers. Therefore when Japan was first united a capital was selected in accordance with Buddhism: a place with perfect balances nature, a solemn quite peaceful place was selected 飛鳥 Asuka. Not much of the ancient buildings remain in Asuka, but the nature is still as it was 1500 years ago, you still sense this feeling of perfect harmony around you, wherever in Asuka you go. The most famous Kofun in Asuka was 高松塚古墳 Takamatsu-Zuka, unfortunately it collapsed one year ago and is currently unaccessible / under reconstruction. The reason is that the mound was opened by archaeologists for the public to have a look inside. Well there are plenty of unopened Kofun in Asuka, and the interior is not that impressive anyway. However that makes them even more powerful, since you know some ancient Japanese Lord or Queen is still slumbering inside. Many of them are so overgrown with forests that you can't get near them. That is what Asuka basically is. There are so many remnants of ancient times, that all you need to do is follow one of the "hiking" routes recommended by tourist brochures, which you can find next to the small station, and look at all the cool things on your way. Also since the nature is so wonderful, and today's Asuka is nothing more than a village, you will have a nice hike indeed. as I think back to all things past. Princess Kibihime was well loved among the people and she became the mother of Emperor Kotoku and Empress Kogyoku. When she died in 643 the people built a mausoleum like burial mound for her and placed four ape statues to guard her resting place. The statues are now knows as 猿石　Saru-Ishi (Ape Stones). Emperor Kinmei is buried right next to the popular Kibihime. He dies almost a century before her in 571. Apart from him also his wife, Princess Kitashi and the mother of Emperor Suiko are buried here together with him. Ancient times were full of legends including Japanese demons and Ogre (Oni). Walking along the little forest paths, you will come across two huge stones. The people in Asuka believed it to be the place Oni use to eat and where they cut humans and grilled them. Indeed the stones have a strange appearance and the atmosphere around the "dinner table" is a bit creepy. There are more curious stones to discover on the way. If you follow the hiking path after the Oni Secchin Stone, you can come across a huge rock shaped like a turtle. Standing there just next to the road. There is a legend to this stone that says that in ancient times there was a big lake in Asuka. In it there was a battle between river snakes and catfish going on. The outcome was in order to defeat the catfish the snakes sucked up all the water of the lake and dried it out. What they did not take into account where all the turtles that lived in the lake, which now also were doomed to die. Turtles are a symbol for good luck in Japan and were worshiped and well loved among the villagers in Asuka. When they saw the lake dried out and the turtles dead they felt pity and carved a big stone in the shape like a turtle as a memorial for the passed away turtles. The stone faces currently south west, the direction where the lake and the hemp shore, the snakes had lived in, was located. My journey through west Japan not only led me to interesting places, but also let me follow interesting historical people who formed Japan. In Asuka this can only be the legendary Shoutoku Taishi. Even in my Japanese class in Erlangen, Germany, even in our text books we heard legends and stories about this prince. All real estate and the people living on it are direct mandate of the emperor and his administration. The establishment of a capital for Japan (Asuka), which will be the center of Japan and the seat for emperor and administration. The first census in Japanese history (Volkszaehlung, counting the number of people), the first measuring of the land and the establishment of a central tax register. All old local/regional tax laws are to be abolished and replaced by the new centrally organized tax system. A very unique interesting character indeed. After I had heard so much about him, I was eager to follow his footsteps and traces, for which Asuka is the best place in Japan. Leaving the hiking trail for some hundred meters I therefore went to the たちばな寺 Tachibana Temple, which is known as the birthplace of Shoutoku Taishi. He was born here in 572 and grew up to a man. He quickly found himself lecturing on Buddhism and writing Sutras himself. A legend says, that when he lectured Empress Suiko in 606, a big lotus flower dropped from the sky into the temple garden. When it fell one thousand Buddhas appeared having halos upon their head above the mountain south of Shoutoku's residence. After this event his residence was converted into a temple, which was named たちばなの木寺 Tachibananoki Temple, which means Mandarin Orange Tree Temple. Now only few of the temples buildings remain, because fires broke out over the centuries and much was destroyed. However back in the time, the temple became one of the most influential temples in Japan and became the school and lecturing place of many important people. A history books states that 49 important Buddhist images were brought from this temple to the Horyu-ji temple in 1078, this must be when the influence of the temple had declined to unimportance. Going back on track, my next stop was the Ishibutai Burial Mound. Probably the most famous one along with the collapsed 高松塚古墳 Takamatsu-Zuka. Its name is derived from its form of looking like a big stage for performances made of stone (石 Ishi Stone, 舞台 Butai Performance Stage). However it was not as the people earlier believed a stage, but a grave for probably the richest and most influential person not being from blue blood in the Asuka Period. In fact his grave is so impressive, that only the graves of Tenno (Emperors) of this time could match it. It was opened in recent times and can be accessed. It was cleverly constructed with an outlet for water to counter erosion over time and indeed the stone structure (without mortar or anything!) lasted now already 1500 years! Impressive indeed! My next stop would be the Asuka Museum. It is a bit far away from the Ishibutai, so I took the bus. The museum tells the story of ancient Asuka and helps you to imagine how things must have looked back then. There is a video corner where you can select videos on different topics concerning Asuka, like burial mounds or the spread of Buddhism. It hosts three big areas and a big open air meadow with reconstructions of the stone works you can find all around Asuka (like the Monkey Stones or the Turtle Stone). Like everything in Asuka, the only language here is Japanese, so be sure to have some Japanese friend ready or be confident in your Japanese skills. My next two stops would lead me to Asuka Shrine, the center of religion before the spread of Buddhism in Asuka and Asuka Temple, the center after Buddhism found its way to Japan. Asuka Shrine is not really special, but it is built on a little hill within the forest and therefore looks really nice and is nice to walk in. You can find many little fox statues pointing to the fox goddess Inari. I have seen many temples during my stay in Japan, but I still had to see this one for his historic significance. It was one of the first Buddhist temple on the Japanese island and is the oldest one still standing. The building of the temple started in 593 and were finished three years later in 596. For its construction many talented architects from the Korean peninsula were brought to Japan, which did at this not yet know how to build Buddhist temples. The temple was a center for power and influence through the Asuka Period and was a central point for the above mentioned Taika Reform. It kept its state of power until the 12th century when it was lost in a fire and never rebuilt. Starting 1959 excavations brought to light the remnants of the temple and after some more years reconstructions could be started. However what you can see today is nothing but a small fraction of the former glory and size and area of Asuka Temple. Inside the temple a monk gladly shows every visitor individually around and explains the temples history intervened with the history of Buddhism and the politics during the Asuka Period. When I finished my tour through Asuka Temple I saw the hsitory teacher I met earlier at the Ishibutai sitting in front of the temple taking a break. When he saw me, he waved to me and invited me to sit next to him. "So, you are interested in Japanese history? ", he said. I replied that I am and he asked me if I know where the concept of Japan comes from? I did not know and he gladly started his story. Before and during the Asuka Period Japan was a refuge country for many Asian people. Sooner or later someone had to leave their home, because of political or religious reasons or because their family angered another more powerful family. All this people would flee further and further eastwards, until many at some point would reach the Japanese Island. From this point on there was no more flight, because at this time, there was no America and Japan was in fact the end of the world. So all these people from China, Korea, Russia, Mongolia, Thailand, Vietnam, etc. found themselves living in Japan without further possibility to leave the island, they could obviously not go back and Japan was the end of the world. So the people needed to find a way to live together, in spite of having different appearance, culture, language, upcoming etc. The solution was similar to the more modern case of America: A national identity needed to be created. So the ruling people had the idea of "creating Japan". They thought of what would be "Japanese" and what would not be "Japanese". They gave Japan a mythological history, how the island came into existence and wrote a story for the Tenno being the son of the sun goddess Amaterasu. So gradually they gave the people a national identity and let them feel as one people, as the people of Japan. With Japan being one of the first multi culture countries in the world, another solution had to be found for all the different cultural habits and customs not to intervene with each other and injure the other pride and beliefs. The soltution is called 曖昧 Aimai and is still as alive in Japan as it was 1500 years ago. "I ate rice this morning and for lunch", pointing politely that the speaker might not want rice also for dinner. Aimai have become an important factor in the Japanese society and foreigners are oftern frustrated talking to Japanese people, since they never say what they actually think or want. A conversation is thus likely to get stuck, since the foreigner is used that both parties say their opinion and than to work on that base and find a solution to satisfy both. While the Japanese will try to withhold his opinion, to avoid imposing it on the partner and try to gradually move a long the conversation road until both are happy. To save some money I borrowed a tent from Randy. However it is pretty difficult to find a place to sleep by tent in Japan. The only options is usually the riverside, every other open space is usually claimed by someone's property or rice field. Even worse most open spaces, no matter if they are used for anything or not, are guarded by alarm systems, which immediately start to cry if you only set one foot on their ground. So the only other option left for me was forests. I had thought about where I'd be able to put up my tent beforehand and forests came to my mind. In smaller villages and towns there is usually always a forest nearby. It took me a while, but with Asuka being a small village it is rather easy to find a place to camp. However I preferred a spot not seen from roads and houses and therefore looked a little longer. Eventually I found a nice flat spot in the forest and erected my tent there. This was my trip to Asuka, a trip that taught me a lot about Japanese history, and about ancient times, a trip that reduced my fear for insects, a trip that let me travel through time for a bit.